Harry Potter fanfic, fanart, vids, essays, meta, discussion, podcasting, fanfilms and more... Donate at paypal.me/FictionAlley to support our site hosting fees and a reconfiguration of our fic-hosting system and forums. 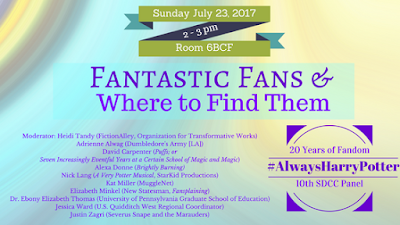 In 2017 we’re celebrating the 20th anniversary of Harry Potter & the Philosopher’s Stone at San Diego Comic Con’s 10th annual Harry Potter Fandom Panel - if you’re going to be at SDCC, we hope you’ll join us! On Sunday, July 23 at 2pm in Room 6BCF (right before the Buffy panel) we’ll talk all things Potter/fandom with @heidi8 (FictionAlley, @transformativeworks), journalist @elizabethminkel (New Statesman, @fansplaining), Kat Miller (MuggleNet), educator Dr. Ebony Elizabeth Thomas (the University of Pennsylvania Graduate School of Education ( @ebonyteach​)), event organizer Adrienne Alwag (Dumbledore's Army [LA]), and creative fans like writer/director/actor Nick Lang (A Very Potter Musical, StarKid Productions (@the-real-team-starkid )), novelist @alexadonne (Brightly Burning), fan filmmaker Justin Zagri (Severus Snape and the Marauders), theatrical producer David Carpenter (Puffs; or Seven Increasingly Eventful Years at a Certain School of Magic and Magic), and Jessica Ward of @usquidditch discuss the magic of new canon on stage, on screen, in amusement parks, in libraries, and, of course, online. Join our mailing list for status/info updates! Can't see the ad? Click here to see the newest special! 2001 - 2010 FAWC. Picture Window theme. Powered by Blogger.